I found your blog page while researching how to find help for treating my right foot. Back in April I finally made myself go to the school doctor about what I thought was just a bunion on my right big toe...she referred me to a podiatrist/foot surgeon in the area who diagnosed it as hallux rigidus, and said my first metatarsal is too long from genetics and that it is a very degenerative disease and I am looking at surgery in the near future to clean out the bone spur, break, shorten, set that long bone and then recover....and do it soon for the left foot which is already catching up and the spur is visible without an x-ray! He said I'm facing at least six surgeries by the time I'm 60, three in each either foot! He said to call him when I was ready to proceed with the necessary surgery. Dr Blake's comment: Since you sound young, did you ever have trauma to that joint? It is extremely rare to have advanced arthritis at a young age, but something does not smell right. But please continue the story. I have put off said surgery and tried to just deal with the daily pain with Ibuprofen, but as I maxed out the OTC dose on it and began experiencing stomach problems from it. Dr Blake's comment: You normally get more local anti-inflammatory dose with a 10 minute ice pack three times per day, with occasional anti-inflammatory drug, and with topical medicines like biofreeze, zyflamend, traumeel, etc. I made it to a different general practitioner (now that I graduated college in May, the university student health center refuses to let me go back to my own who originally referred me to foot doc. #1. They refuse to even send that referral to a different doctor for a 2nd opinion, and asked me why I didnt' go to the first one!?) This new GP looked at my foot, listened to me, and switched me to Aleve (naproxen sodium) which seems to be working better, but even on twice daily prescription strength regimen, I am still in pain! Dr Blake's comment: So, where is the pain? In the joint? On the bunion bump? Generalized around the front of your foot? And do you have a bunion also? Dr Blake's comment: Before anyone touches your feet, you should get an arthritis doctor (rheumatologist) to work with you. You do not want a lab test ordered unless you are with an experienced doctor who is wise and can interpret the results. Lab tests have false positives and false negatives, so the whole picture must be looked at carefully. You do not want a label if you really do not have the disease. .so I heard that rheumatoid arthritis now has a simple blood test...but the new GP did not want to do it on my first visit....so now if I want to get it, I have to go back to her and pay out of pocket again, because my oh so wonderful student health insurance ends, July 31st! So now, unfortunately, I will be "self-pay" and need to pay out-of-pocket for any surgery, treatment etc! It keeps adding up! Foot doc #1 wants $500 just to come talk to him about surgery, and if he has to do any x-rays the cost is more! Other foot surgeons want at least $250 just for an initial visit, etc. Dr Blake's comment: There are many great doctors at teaching hospitals around the country who will work within the system to provide you great affordable care. Are you near a big city that has such a program? You must be willing to go along with all the red tape of any buracracy. So, I am intrigued by your ideas about non-surgical treatments for hallux rigidus. I am finding that idea echoed in some of the studies I've seen online...Please contact me with any info you may be able to share with me on the issue. Dr Blake's comment: The blog is full of tips for treating hallux rigidus conservatively, but you must go through phase one of rehabilitation first: The Immobilization and Anti-Inflammatory Phase. Yes, you must create a pain free environment. Every step you take that causes pain can be keeping it angry and inflammed, and delaying healing. You can buy the Anklizer Removable Boots online relatively cheap, you can go to shoes stores and see what type of shoes help a lot (like possibly Dansko clogs, or stiff hiking boots), learn to spica tape and apply dancer's pads. Ice, Ice,and Ice some more 10 minutes at a time. None of this will break the bank while you search out medical help. I live in North Carolina, near Charlotte, so do you know of any good doctors who share your opinion for non-surgical treatment of hallux rigidus? Or who may be able to provide a reasonably affordable RA screening in my area? Dr Blake's comment: A colleague Dr L. Douglas Milch, Asheville, North Carolina, could probably tell you who to go to in Charlotte. Please use my name as a reference when you call. Good luck and email with answers to my questions and any photos or xrays, etc. I actually spent last summer volunteering with the Lighthouse for the Blind and Visually Impaired out your way, in Napa, CA at Enchanted Hills Camp. While I love the area, I doubt I could move out there permanently for treatment! and had ART on the hamstring. Glad to say it is finally resolved. Dr Blake's comment: ART stands for Active Release Technique and it is wonderful for plantar fasciitis. I have limited experience for injuries above the knee. little thought. Not sure hamstring/sciatica is involved with Morton's Neuroma, but once I returned to running (50-55 miles per week) I started to feel a burning sensation on the ball of my foot same side as hamstring and/or sciatica issues. Dr Blake's comment: I remember one of those angry letters I got early in practice 25 plus years ago. It was from Ann (real name since docs remember their failures more than their successes). I had treated her for hamstring strain for 3 months with only slight improvement. Then, another doc diagnosed sciatica as the cause of her hamstring tightness and soreness. I guess it came from her back, but I never saw the completion of treatment. But, I remember making this permanent correlation to foot nerve symptoms to possible back involvement. Over a 2-week period it got worse. Always worse at the beginning of a run, then subsided but soon after realized my toes were actually feeling more numb. 2 weeks ago in an attempt to stay local in Novato (thirty miles from Dr Blake's office) had it diagnosed as Morton's Neuroma, (x-ray taken was unremarkable) and sent away for a week with a metatarsal pad placed on my foot - my options were cortisone shots, a series of alcohol injections and if they failed surgery. Dr Blake's comment: Yes, these are 3 options in the treatment of Morton's Neuromas, but far from a complete list of treatments. In the meantime I did some research and asked around in the running field and quickly learned some of the treatment options for example, the importance of proper placement of the pads and frequent icing. Since reading your very helpful blog I am icing for 10 mins 3x day. When I returned on Wed the advice was cortisone as the neuroma was described as being large. Dr Blake's comment: Please read my post on the Theory on Cortisone Shots below. I took the shot and continued pool running until today (Sat). I had little pain running but resumed at a lesser intensity as the day went on. I am wondering what your advice would be at this stage of the process. Should I keep running, can I expect further improvement with the cortisone treatment if I am still feeling some pain?? Dr Blake's comment: After reading the post on cortisone shots, you can see that you really must wait 2 weeks before you should run, and another 1-2 weeks to see how running feels. So, minimum to see me is 3 weeks after shot. The next steps are to get a better nerve testing with straight leg raising, neural tension testing, and Mulder's sign. An MRI with dye is conclusive from neuromas, but some neuromas actually do not hurt. You definitely, by your history of possible sciatica, could be a double crush victim. That changes everything, and the source of the nerve pain must be treated along with the foot pain. This is normally when I co-treat with a physiatrist or neurologist. I will make an appt to come see you but wonder if and when I should do so. Hi Dr. Blake -- I came across your blog and would love to ask you a few questions about my sesamoid injury. I'd prefer to keep my name and personal information anonymous. I'm a 29 year-old female and injured my tibial sesamoid in my right foot in September 2011. There are 2 sesamoid bones under the first metatarsal of each foot. The thumb also has this arrangement. They are designed to not only protect the main joint, but actually improve the muscle function. 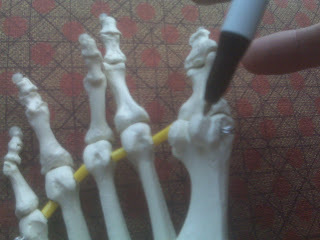 The pen points to the medial or tibial sesamoid. The one closest to the second metatarsal is the lateral or fibular sesamoid. I am not exactly sure how I did it (either too much walking on concrete in improper shoes or jumping rope) -- I also have a very high arch (14 degrees) that could lend itself to this injury. Dr Blake's comment: High Arches have a steeper slope to go from the arch to the ball of the foot. This steeper slope can lead to more pressure on all or some of the metatarsal heads depending on other factors. Also, the higher the arch, the more the weight bearing is on the heel and the metatarsals only. 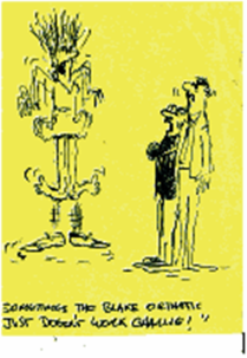 A Flat Foot (aka Fred Flinestone foot) is more democratic with its weight bearing responsibilities. 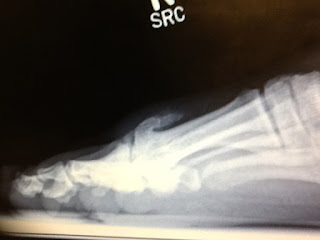 I went to a podiatrist about a month after the onset of the pain and he took a basic x-ray that indicated a fracture. Dr Blake's comment: Golden Rule of Foot: An Injured Sesamoid normally needs an MRI, X-rays can be very misleading. He told me to wear a dancer's pad and that I should heal. Dr Blake's comment: The French love their ballet. In the 1700s, and probably before, the first mention appeared in the French literature of a pad that helped ballerinas with sore first metatarsals. Such a pad is fairly universally called a "dancer's pad". 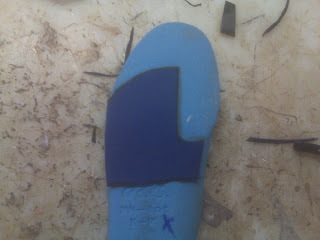 Here a dancer's pad to take pressure off the big toe joint and sesamoid area is glued to the undersurface of shoe insert. Dr Blake's comment: In treating injuries, from apparently minor to major, the goal is to create a pain free environment for healing. The question is whether the dancer's pad did that for you. If you were pain free for 3 months wearing the dancer's pad, most fractures should heal, but some do not. In May 2012 I was still in pain, visited another podiatrist who sent me for an MRI. The MRI showed that I had a non-union fracture of my tibial sesamoid. I decided to follow up with a surgeon, and he put me in an aircast for 7 weeks (with bone stimulator twice a day) in an attempt to heal the bone. I just went for my follow-up appointment with him two days ago and the x-rays indicate the the sesamoid may be necrotic. Dr Blake's comment: This means that part or all of the bone is dying. Bone Stimulators increase blood flow so much to a fracture area, that the necrosis that they are seeing, could definitely be actually bone healing. MRIs over read these changes as necrosis. If curious, I would rather you push for a CT Scan to document the injury without all the soft tissue shown on MRI in the way. I'm having another MRI on Tuesday to confirm. The surgeon took me out of the boot and said I can graduate to tennis shoes now, but not other shoes, and that I should continue using the bone stimulator. If there were any chance of natural healing left (and he indicates there is given the recommendation to stick to tennis shoes and the stimulator) why would he also take me out of the boot? Dr Blake's comment: I agree, stay in the boot for 3 months completely, than wean out of the boot gradually, over a 6 to 12 week basis, as long as you maintain a pain free environment. The weaning process is never cold turkey, it is gradual, and there will be less chance of flareups. Flareups are so psychologically damaging that unnecessary surgeries are done due to the frustrations. Are you out of pain now, or do you still have pain in the cast? The surgeon has told me that surgery is elective but should eliminate the pain. The surgery, because of my high arch, would be fairly complicated -- removal of sesamoid, yes, but also a number of other modifications to lower the arch and reduce load bearing on the remaining sesamoid. Frankly, the surgery sounds like overkill and maybe a more drastic thing than I'd be willing to do (removal of muscle tissue from other parts of my leg, etc). Dr Blake's comment: Our office occasionally has to take out a broken sesamoid that will not heal, but we relie on orthotics, etc, to do the rest. If you have to have the tibial sesamoid removed, see my post on preventing bunions, since the tibial sesamoid and corresponding tendon counterbalance the forces that make bunions. 1) If I go back to normal behavior (regular shoes, regular exercise), is it simply a matter of dealing with the pain, or would I be causing long term damage? Step 2: Once the Environment is Painfree, gradually increase function over as long a period as necessary to keep the pain level between 0-2. Step 3: With each plateau in function below normal, and with a pain level between 0-2, search for ways to improve function. Step 4: If a plateau is stubborn, have your treating doctor send you to several respected healthcare providers (not necessarily in the same discipline) for 2nd opinions. Step 5: If surgery seems imminent, and all stones have been turned over, do the surgery that is the simplest to get rid of the problem (KISS--Keep It Simple Stupid). 2) Assuming the MRI confirms the diagnosis that the bone is necrotic, are there any non-surgical treatment options left? Custom orthotics, etc.? I really appreciate any advice you can offer! Julie's response to my questions came the next day. Dr. Blake -- Thank you so much for taking the time to answer my questions and help me think through my sesamoid issue. I can't thank you enough! In answer to your question about whether I am pain free, well, I am not. By week 7 in the boot, I thought I had reached a point of experiencing little pain (in earlier weeks, I would mostly experience pain when taking the stairs and at random moments of foot pivoting). However, when I removed the boot a few days ago per my doc's recommendation, the pain returned and actually at some points the pain was quite intense -- worse than what I was feeling prior to getting in the boot and starting the bone stimulator. I'm not sure how to explain that, but I've taken your advice and am going to wear the boot until I'm pain free. Dr Blake's comment: If you are in a healing mode with the sesamoid, there is a lot of circulation which brings in healing cells, minerals, proteins, etc. This increased circulation collects under and around the sesamoid and hurts to walk on. Bone stimulators which improve even the normal circulation make this worse. So, you had 0-10% chance of having survived going cold turkey from the boot (even when everything is fine!!). The weaning out of a removable boot can be a very delicate matter. You need to do it gradually, you need to have the right shoes and inserts on that protect the sesamoid, you need to ice 10 minutes 3 to 5 times a day to reduce inflammation, and spica taped. The first goal to weaning out of a boot that you have worn for 3 months is to wean out of the boot into normal athletic shoes. The second goal, after 2 weeks of being okay with athletic shoes and full time out of the cast, is to introduce another variable: increasing distance, adding another type of shoe, etc. But, you have to wean out of the removable cast first. I tell my patients while they are weaning out of the cast, they have to have the cast to put on with them always. This is true for 2 weeks longer than you think you need the boot. So, Julie, next time you attempt to wean out of the boot, go gradual, have the boot with you, ice, tape, pad, shoes, giving yourself the best bet to make it. 1) I'm getting another MRI tomorrow (and plan to take your advice in asking for a CT scan as well). Would you mind if I sent you my MRI results to examine? I could also send you my MRI results from 8 weeks ago if that would help, and I have of course of plenty of x-rays that I could share too if that would also be helpful. Dr Blake's comment: This is great. Mail to Dr Rich Blake, 900 Hyde Street, San Francisco, Ca, 94109. 2) I used to practice yoga regularly and have since stopped because I thought it would aggravate the sesamoid (especially standing poses and lunges). If I were to tape the toe and heavily pad my foot, do you think I could carefully return to yoga and some of these poses? Or could I try doing it in a shoe? Dr Blake's comment: Yes, tape, pad, and listen to your body. Find what you can and can not do. The more you can do, the better you will feel. The better you feel, the less upset you will feel, if you are limited for a while. Listen to Your Body!!! And, do not do in shoes. Ballerina slippers is okay if helpful with the padding. 3) On that note, as I'm sure you and the many readers of this blog know, being in a boot can be highly frustrating! Is it acceptable to wear other shoes occasionally assuming that I have everything properly padded the foot and don't experience pain while walking? Additionally, I'm wondering how far you would say is acceptable to walk in the boot? Dr Blake's comment: The key is no pain, and listening to what your body says. An EvenUp for the opposite side can help you keep level if you are having problems with shoes accomplishing this. Go to www.EvenUp.com. There is a weight problem with the boot, but walking normally to slightly slower is okay for long distances (many miles) if you feel even. 4) I live in NYC and would love to visit another doc. Do you have any recommendations? I use United Healthcare. Again, I am SO appreciative for your advice and look forward to your thoughts. I love to have my plantar fasciitis patients tape for some of their activities. Even when they have orthotic devices, when they fit their heel off the ground, they lose some of the effectiveness of an orthosis. Tape comes in handy when running hills, or in sports like basketball when you are up on the ball of your foot for an extended period of time. Learning the skill of taping, and there are so many methods, can help you avoid reflares. Patients will only tape when they need to, but they must find out when they need to, and they must have the skill of self taping in their arsenal of tricks that help. Acupuncture is an excellent tool to help various foot and ankle problems. This short video is meant to show those you have not been exposed to acupuncture one of the many types of therapies offered. I live in San Francisco, California, where acupuncture is widely used and accepted. This may not be in other parts of the country or world. Podiatrists are always placing things inside of shoes. For many of these patients, it creates another problem of heel slippage. The Asics Gel Landreth neutral running shoe has a very unique heel counter and lacing system that can eliminate this problem for most. This is great article on high heels and their appeal. 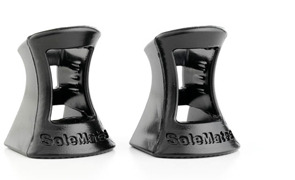 Can alittle compromise be made with 30% reductions in overall wear and 3 times a day achilles stretching. Please!! British women have tottered their way to the top by wearing the highest heels in Europe, with the average heel height at 3.3 inches. Some take it to even greater heights, with a quarter of British women surveyed (25%) wearing heels 4-6 inches high, and a skyscraping 3% braving heels that are more than 6 inches. In comparison, Spanish women wear an average 3.2 inch heel, Denmark 3 inches, Germany 2.7 inches and France 2.4 inches. 1 in 2 women (50%) are prepared to endure a level of pain they ranked as comparable with tooth ache and ear ache. Lorraine Jones, member of the Society of Chiropodists and Podiatrists says "As a podiatrist, I recognize that with fashion as it is, wearing foot-friendly shoes is not always easy. However, wearing fashionable shoes occasionally is fine, and there are plenty of easy foot care treatments available at the local pharmacy that can help treat feet at home and avoid a trip to the podiatrist's clinic. The bonus is that with healthy feet, a woman can stand as tall as she wants in the highest of heels." Dr Blake's comment: Women who wear high heels on a daily basis are encouraged to stretch their achilles tendons 3 times a day to prevent serious tightness from developing. A tight achilles tendon can make it hard to walk normally when not wearing heels and is blamed for a variety of medical problems like achilles tendinitis, plantar fasciitis, arch pain, metatarsalgia, and many others. The following video will demonstrate how to stretch your achilles properly. This next video which features my wife Patty discusses some of the generalizations of the pros and cons of high heels. And finally here is a link to the post of the components of a stable high heel shoe. At least, if your heels can be stable, you will have less problems. This video looks like it has a lot of usefulness for the physical therapist and massage therapist treating stubborn plantar fasciitis. This is an email I just received regarding Hallux Rigidus possible surgery. I have been recommended surgery for this condition. As long as I have good shoes on, my toe does not bother me significantly. However, I do experience some pretty severe pain at times if I've overdone it or ran around barefooted. I'm 46 and active with three young children, and the doctor recommends surgery before the condition progresses to a point of having the joint fused. I'm hesitant, not knowing how long it will be before the joint requires that. If it's going to be 30 years, I'll put it off. I guess my question is, when do you make the determination surgery is necessar? Is there truly a benefit to correcting this condition early on while things aren't so bad, or should a person wait till things grow far worse? I have been dealing with sesamoiditis in my left foot for close to two years and i just would love to get some relief. Originally, I was placed in a walking boot for about 4 weeks, referred to PT, X-rayed and given orthodics. I never really had relief of the pain in my foot. I have also tried MAT, muscle activation technique, to help deal with the any bad habits or patterns I have with my gait. Again, nothing really helped. Despite the chronic nagging pain in my foot and resting it for a long time, I started walking and running in our beautiful Redwood forest. Wearing stiff shoes, running dirt trails and not wearing my orthodics was working for about 10 months. Just a month ago, I went back in to see my podiatrist because the pain was starting to get worse and I was experiencing numbness between the first two toes through to the top of my foot with swelling. The Dr. injected the sesamoid area and fitted me for new thinner orthodics that can fit into shoes. The pain is not completely gone. The problem I face is that I am a Pilates Instructor and I cannot wear shoes all the time in our studio. I have been wearing new shoes with my new orthodics in them, but it can get tricky. My bare foot cannot handle standing on the floor for a very long time either, even with taping. I am just at a point of frustration and feel like it will never get better. Repeat X-rays were also negative for a fracture to the bones. Have you seen people with this as a chronic pain? I am wondering if PT to help identify any bad foot and ankle movement patterns would help? Thank you for your time. Sounds like there was an improvement between the first and second orthotic, but what was it? More Arch? More padding? Since Pilates instructors can use ballet slippers and various forms of arch support (Hapad) and dancer's pads (adhesive felt), knowing the components of an insert that helps can help with other shoes. What helps control the pain? Cortisone shot, but try to avoid too many of these. Did the removable cast help that you used for 4 weeks? If you have bruised cartilage between the sesamoid and the first metatarsal, it can take 3-6 months in the removable cast, at least for some part of the day, to really get ahead of the symptoms and allow for the decreased stress to allow for healing. Until you have a diagnosis, wear the removable cast with the orthotics in them and with an EvenUp on the other side anytime you are not working. You are not doing enough daily to influence the swelling. Day after day of pain begins to magnify the pain response and swelling occurs. Also, not only does the swelling block the normal circulation, but nerve pain can occur vaso spasm further cutting off the normal circulation. End result, the injury gets worse, chronic, and forces you to reach out to a blogger (a little blog joke!). So everyday, ice pack the ball of the foot for 10-15 minutes twice and do one formal session of contrast bathes. Are you still better in stiff soled shoes? Continue slip-on gel protection instead of barefoot (always get for both sides). Wear the removable cast, except for when you are teaching, as long as you can get it comfortable. Definitely spica tape of teaching and ice immediately after. Start doing 1-2 foot strengthening exercises tonight (some on the blog) and every night, but not the ones that hurt the sesamoid area. If stiff soled shoes help, try to stay in them 24/7 if it gives you the exact same relief as the cast (at least they can be used when weaning from the cast in a few months). Email me again with any other thoughts and changes over the next few months. I have had a painless, swollen great toe for a few months. My family doctor does not know what it could be. The bottom of the toe is affected. The nail appears normal. I wonder if it could be due to wearing flip flops while working outside. Thank you for your time! Swelling with no pain in the foot is actually quite common. That swelling can be drainage even from the knee as gravity pulls swelling down, down, down. This is why it collects on the bottom of the toe. Low grade trauma to the big toe with abnormal stress of flip flops is quite realistic. Golden Rule of Foot: Try to manipulate the swelling to see if it will go away. Your arsenal of weaponry is some elevation whenever possible at least above the ground a few inches on a stool, compression with Coban wrapping 24/7 for 1 week to check if helpful, ice pack 10 minutes twice daily, and any number of OTC anti-inflammatory medications or salves (advil, aspercreme, zyfamend, mineral ice, biofreeze, etc, etc, etc). So many of these, but I would start with something and apply 2 or 3 times per day. Dr Blake's comment: This is a wonderful email for my long time friend and a patient who suffers from terrible arthritis in her feet. Her Physical Therapist set her up with this and now it is a daily home program. I hope it can help many patients who suffer from foot and ankle pain on a daily basis. Thank you Tam!! 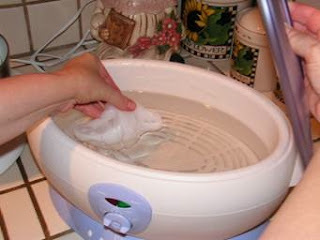 This is the process I use to do the paraffin dip on my feet: my machine holds six 1-lb. blocks of medical grade paraffin. I buy this at a local medical supply store. First, I test the melted wax to see if it’s warm (not hot) with my wrist. If it feels okay, I go ahead and dip my foot into the wax, and quickly remove it, holding it out each time about 5 seconds just to allow for the coating to set a bit, and then I repeat this dipping process 5-8 times. The wax builds up onto the foot and creates a warm, and soothing heat that penetrates into my foot much more than if I just soaked them in warm water. I keep the wax on as long as it feels warm to my foot (under the wax). The wax itself will start to feel cool to the touch but you will still feel the heat on the foot as the wax does a great job of holding that heat in. I usually leave it on 20-30 minutes. When I am finished, I insert my finger under the wax to start the peeling process. It comes off really easily. It has the added benefit of adding great moisture to the skin! Since I am the only one using this wax, I can place the used piece back into the machine, which will re-melt it, and it will be ready for me the next time I need pain relief. I leave mine plugged in, on the kitchen counter with the lid on. I leave the temperature on “medium” but check with your machines instructions to guide you. This is great to use first thing in the morning, before a walk, to warm-up sore feet. You can follow it with stretches or foot exercises as well. I try to ice my feet after I’ve completed my physical activity to help with any swelling that might occur. Lastly, it feels really good at bedtime if your feet are sore from the day. If you want to dip further up the foot, such as the ankle area, just melt more wax into your machine. I hope this will bring others the relief it has brought to me! Power Lacing can improve the stability of a tie on shoe up to 50%. When evaluating a shoe before purchasing, make sure you power lace it and walk or run around the store. Make sure the shoes feels stable. In this next video, you must walk or run with the shoe you are evaluating. Get a feel of what is stable. Focus on whether the shoe is unstable to the outside called excessive supination. This is very damaging. I would much prefer a patient pronate too much than even supinate a little. Before purchasing a shoe place it up on a flat surface and look at the back of the shoe. If it is leaned outward or inward from the start, it may do dangerous things to your body if you try to move with them. This is an post from the Podiatry Management Online Newletter. Thank you. Save regular lotions for dry arms and legs -- most are not moisturizing enough for the tough skin on your feet, says NYC podiatrist Dr. Johanna S. Youner. Instead, slather on a thick cream with hydrating shea butter. If you've got parched, cracked heels, you'll need an ointment containing acids (like salicylic or lactic) to break down dead cells, says Dr. Youner, who likes those from Kerasal. Dr Blake's comment: One of the common Rxs I write for is Carmol 40 Urea Cream for dry skin. Another OTC is Amlactin. I am a Podiatrist working in Australia, I have become very interested in learning more about your prescribing technique and the features of your orthotic design. I am finding it really difficult to find information and resources, could you please point me in a direction or perhaps email me any information you have on digital format? I have read Michaud's work and his textbook, but would like some further information. I am unsure of many things regarding your email, so I must start with many questions for you. First of all I am very happy to help you. Biomechanics and orthotic devices are my passion and I still make my own. I base my initial assumptions on biomechanical support on the historical information of what needs to be treated, and the gait evaluation of the patient. Is there a pattern in the walking or running gait that explains how they have injured themselves? Of course, many activities are not so simple, or at least you need a working knowledge of the biomechanics of fencing, ballet, tennis, etc. There are so many subtleties of mechanics and their treatments. Some of these subtleties are important and others not. Can I teach you this? I will try to start the process. You may be actually ahead of me in your knowledge. I will try to make no assumptions. My last attempt at writing biomechanics, besides my blog, was 20 years ago. I was trying to raise my family and be a good father and husband. This part of my life needed to be on the back burner (as a teacher). And, I have learned so much in those 20 years through my successes and failures. So much of what I find important I now need to impart via this blog that I am committed to writing. I hope you will work with me. So Jason (I will use your real name if you grant me permission), let us begin. I need to know some background information. Are we only talking about the Inverted Orthotic Technique with all of its modifications? Do you have a lab that makes this device? Do you watch patients walk? Would you know the difference between mild, moderate, and severe over pronation? Would you be able to recognize over supination or lateral instability? 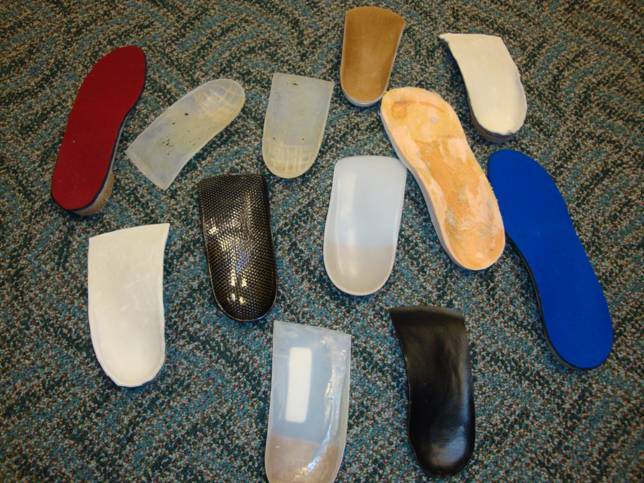 Can you adjust your orthotics readily in the office? Are you afraid to make mistakes (I still make plenty)? Do you want to learn about other techniques like the Hannaford? Can you or your lab make a great Root Balanced Orthotic Device? Can you spend time with your patients for evaluation and dispense? I think we should stop here. I will await your responses and go forward. Rich I have placed our correspondence under the lab of "International Biomechanics" for ease of cateloging.